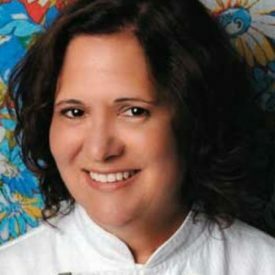 By bringing Brazil’s traditional foods like cassava back to life in top culinary markets, Chef Teresa Corção is helping both small farmers and the country’s health.Teresa Corção is President of Instituto Maniva ,an organization that protects and promotes the quality of food produced by the smaller farms of Brazil. She is also the chef and owner of the restaurant O Navegador in Rio de Janeiro. After graduating from St. Martins School of Arts (London), Teresa took a different career direction and joined one of her sisters as chef and co-owner of the family restaurant (Rio de Janeiro) “O Navegador”. In 2002, she launched the « Cassava Project » to protect and promote the most significant cultural asset of Brazil’s indigenous peoples. After joining the Slow Food Movement in 2001, Teresa started Projeto Mandioca in 2002 in order to teach public school children from the slums about manioc, an important Brazilian heritage food.Using history, folklore, and cooking classes, Teresa taught children how to prepare tapiocas and mandioca crêpes, while also simultaneously teaching them about their culture She has received a number of awards, including in 2010, the Humanitarian Award from the International Association of Culinary Professionals, in Portland, Oregon.